Mount's Bay, Cornwall. A woman and a boy survey the damage caused by the oil spill from the Torrey Canyon. Invasion of Britain 1967...A woman at Mount's Bay on the Cornish coast stoops to examine the tidemark caused by cruds of oil washing ashore from the crippled tanker Torrey canyon. In the background is St Michael's Mount, a noted holiday spot...but perhaps not this year. Serena Wadham , “Mount's Bay, Cornwall. 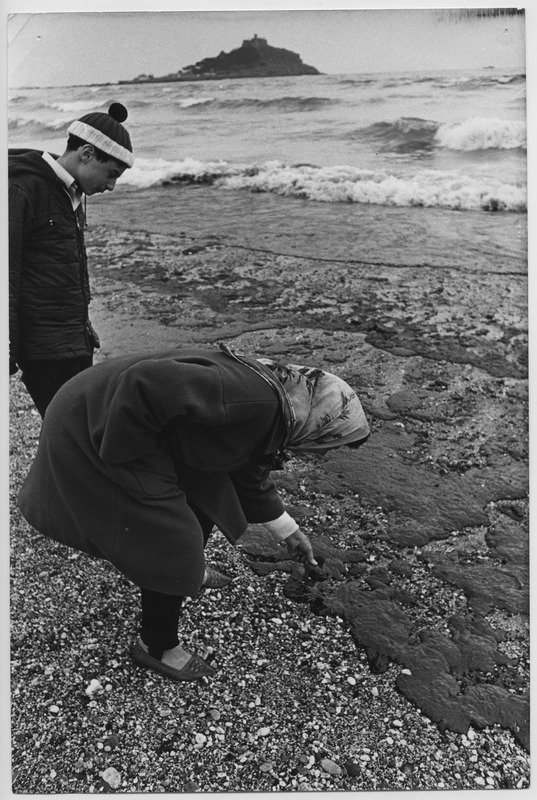 A woman and a boy survey the damage caused by the oil spill from the Torrey Canyon.,” Morrab Library Photographic Archive, accessed April 19, 2019, http://photoarchive.morrablibrary.org.uk/items/show/14963.